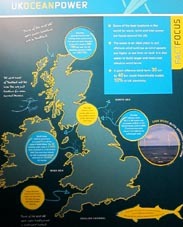 > Some of the best locations in the world for wave, wind and tidal power are found around the UK. > The ocean is an ideal place to put offshore wind turbines as wind speeds are higher at sea than on land. It is also easier to build larger and more cost effective wind farms. > A giant offshore wind farm 30km by 40km could theoretically supply 10% of UK electricity. > Scientist estimate that the total average wave power along the west and north shoreline of the UK is equal to 260 TWh per year. The UK electricity demand in 2002 was 350 TWh. >　The best offshore wind power sites are in the shallow waters of the North and Irish Seas. 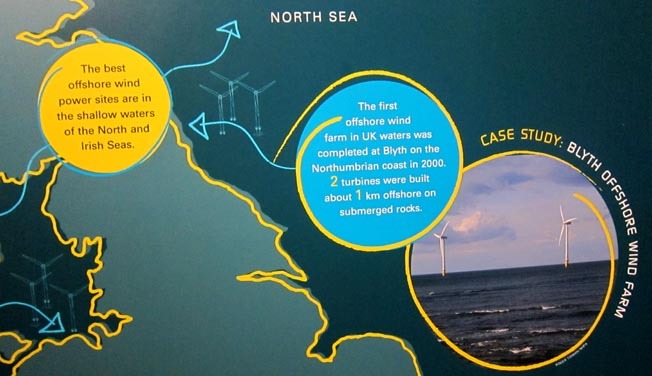 > The first offshore wind farm in UK waters was completed at Blyth on the Northhumbrian coast in 2000. 2 turbines were built about 1 km offshore on submerged rocks. The 30 turbines, each rated at 2 MW, were switched on in November 2003. The wind farm should be able to generate enough electricity for 50,000 UK homes. >　Large estuaries, such as the Severn, make the best sites for tidal barrages and tidal current devices. > Fishermen have reported increased fish stocks around offshore wind farms. They can act like artificial reefs and encourage sea life. > Some of the best UK wave power locations are in Scotland.